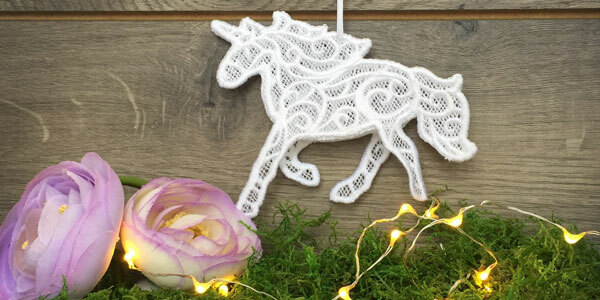 A magical unicorn comes to life with this sweet three-dimensional embroidery design. 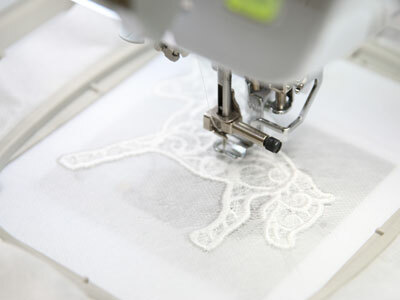 Three pieces are stitched together to create the soft and ethereal 3D mythical creature. 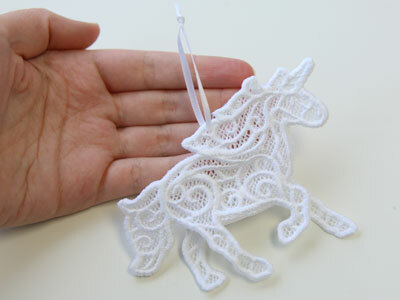 the lace unicorn are below. When you download the design, you will find a total of 3 files. The files labeled with the letters "a" and "b" are the two sides of the unicorn. 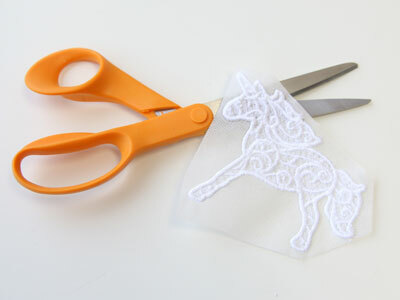 The file labeled with the letter "c" is the unicorn's belly. 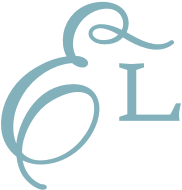 Load the first file (piece "a") onto your machine. 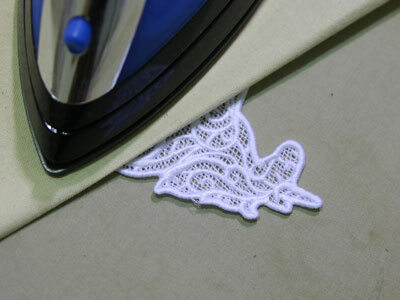 Repeat the steps above to embroider the other two lace pieces ("b", "c"). 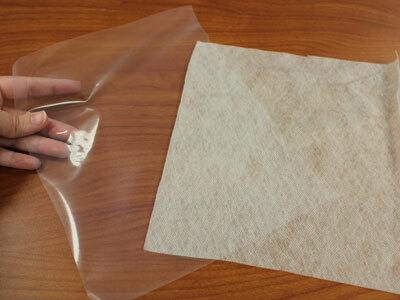 After they are completed, starch the side and belly pieces flat before assembling to make them sturdier. 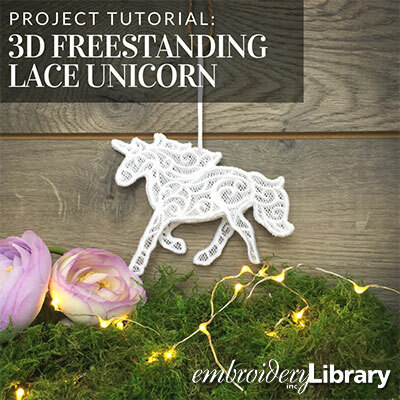 Take the two side pieces of the unicorn ("a", "b"), and hold them together, wrong sides together. Starting at the underside of where the snout meets the neck, hand sew the two pieces together. 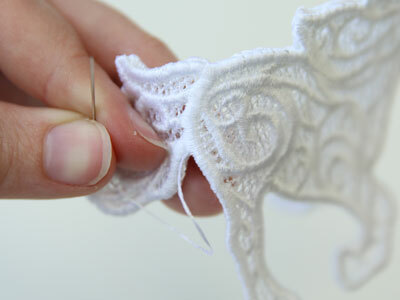 Make sure to hold them securely while sewing so the two pieces stay lined up with each other. 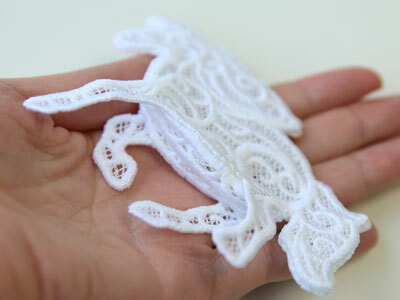 Continue sewing until you get to the point where the underside of the tail meets the body of the unicorn. 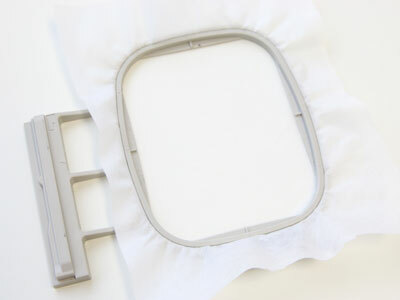 Next take the belly piece ("c") and line one side up with the bottom edge of one side as shown. 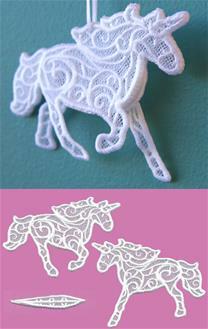 The thinner end of the belly piece goes by the head of the unicorn. 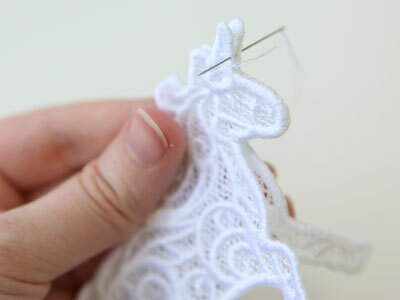 Make sure the right side of the lace is on the outside of the unicorn, and hand sew starting from under the snout to the underside of the tail. 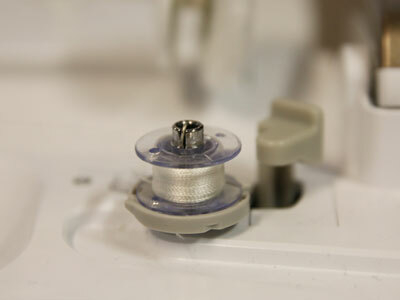 Then tie off and get another length of thread. 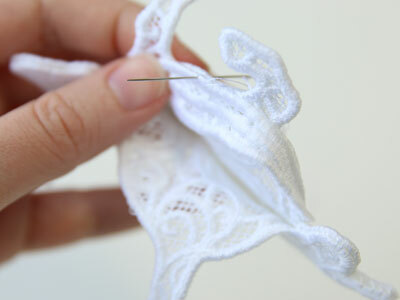 Sew the opposite side of the belly to the other side piece. 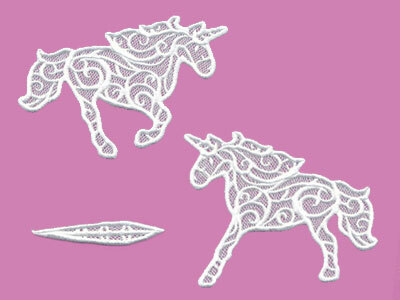 Again, make sure to start sewing from the snout and moving towards the back of the unicorn. 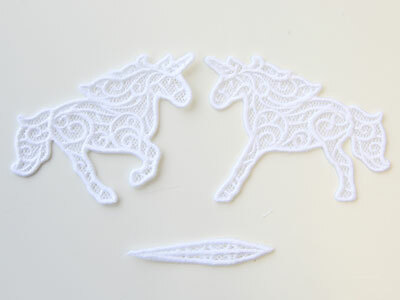 Finally, cut a 6" length of ribbon or twine, and thread it through the mane of the unicorn. 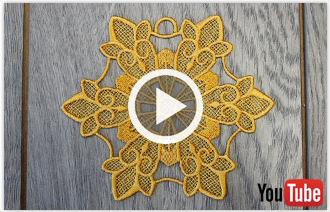 Tie it into a loop, and use it as a hanger. 5.39" x 4.86" | 4.86" x 4.37" | 3.85" x 3.47"